You don’t need a Border collie or a Scottish terrier to go hiking with your dog in Scotland, but if you happen to have a BC, you’ll certainly be in good company. Even if your hikes don’t take you to the Borders. Scotland is a hiker’s paradise, dog or not, with gorgeous scenery and friendly people who are inveterate trekkers themselves. What will you see? Moors and mountains, forest and lakes – the Scots call them lochs -- and many, many miles of shoreline. Quaint towns and the occasional big city, castles and other evidence of ancient history everywhere you go. Scotland is also renowned for its sheep and wonderful wools. While your dog is accompanying you strictly for companionship and entertainment, many of the Scottish dogs you’ll meet as you hike are on the job. It’s great fun to watch the collies work the sheep – in fact, it’s a don’t-miss sight. However, it is essential to keep your dog under control and well away from the action. It is crucial to keep your dog away from any farm animals, too, and out of farming fields. And speaking of farm animals, one thing you’ll notice about Scotland is that once you get outside the cities, not all livestock is restrained behind fences or hedgerows. It’s not uncommon to see random sheep, cows, or pigs strolling through the villages. That makes it doubly important to keep your own dear canine on a leash when you’re out and about. In many areas, such as near the shore, you’ll also want to be mindful of ground-level bird nesting sites. The Scottish Access Code explains how to be a good neighbor as you travel around the rural parts of Scotland (which is most of the country, really) with your pooch. You can download this great leaflet and print it to carry with you as you tour Scotland on two and four feet. The Scots are a practical people, so the “rules of the road” for dogs and their humans are based on common sense. Keep your dog on a leash or “at heel.” And pick up after him. If he’s quiet and well-behaved, he will be a treasured guest wherever you go in Scotland. Where to hike for a tail-wagging good time? Borders – the River Tweed and plenty of castles populate the land along the English border. Fife – fishing villages and the town of St. Andrews. Dumfries and Galloway – outstanding views and no end of places to walk in this southwest section of the country. Loch Lomond and the Trossachs – the 720-square-mile Trossachs National Park was the first in Scotland, and well-known Loch Lomond is the biggest fresh water lake in the UK. Can’t miss that! And if you feel the need for an urban break, you can catch the sights and sounds of nearby Glasgow. Oban and North Argyll – with so much coastline, you can look forward to endless seafood options. In fact this area is considered by many to be the “seafood capital of the world.” Yum. Want some specific ideas about where to hike with your dog? Check out the “canicross” website, which recounts one couple’s adventures with their beagles, complete with lots of photos. “Our trips are carefully researched to experience each location at its best,” they note, “sometimes rising at the crack of dawn, or wild-camping on a mountain top for a dawn/sunset ridge run.” If that sounds like your cup of tea (or Scottish ale or Scotch whiskey), read their blog. It’s filled with articles about their many “canicross” experiences. Whether you’re looking forward to a fabulous Scottish holiday with your pup or you’re getting ready for a permanent move to the country, there are many things you need to know before you go. International travel with pets requires advance planning! 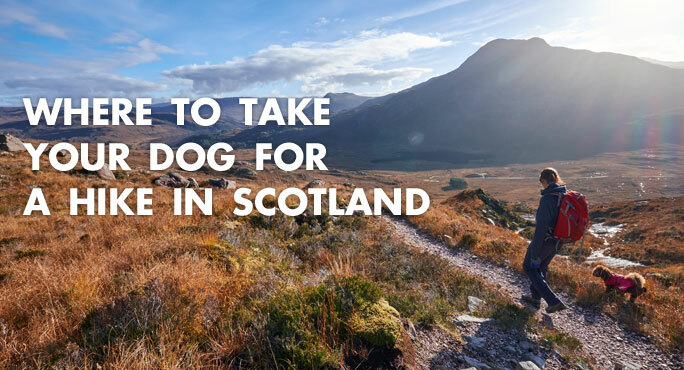 How will you and your intrepid canine get to Scotland? By air, of course. You’ll arrive in Edinburgh, but don’t plan on heading out to the countryside right away. This lovely city is filled with historic and dog-friendly landmarks, not to mention pubs and accommodations that are just waiting to welcome you and your furry friend.